Students at Valley Christian Schools’ Conservatory of the Arts in San Jose, CA are honing their musical skills in a high-tech rehearsal and performance facility. Completed in late 2011, the new Conservatory building incorporates a multipurpose rehearsal hall that can be used as one large room or divided into two smaller spaces. 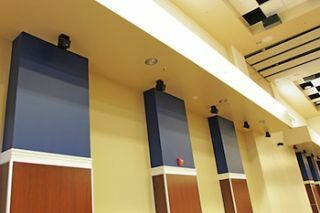 In any of the three space configurations, the acoustical characteristics can be optimized for music style and ensemble size using the permanently installed Meyer Sound Constellation acoustic system.